Feeling too lazy to get a taxi to the various must do dining spots in Seminyak we strolled up the road to a French restaurant that was recommended on a list of ‘best’ eating placed ranging from budget to expensive. This one was apparently very expensive, but not overly so by Sydney standards. It was a treat. Christian Vanneque is a chef from Paris and this is a quintessentially Parisienne experience. 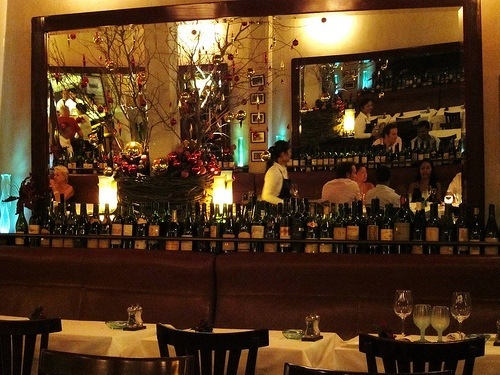 The walls were lined with old bottles of wine. Beautiful starched white tablecloths and Reidel stemware. Tables squashed in tightly against a banquette and beautiful little table lights on all the tables. Food was very French- we shared a plate of escargots that were the best I have ever eaten. They were more like molluscs, plump and tender and served in a lovely parsley sauce that was neither too garlicky or too buttery with some lovely bread to mop up the sauce (good bread being a rarity in Asia). I suspect that if you didn’t know what you were eating you would instantly become an escargot fan. I then had the most wonderful steak tartare while M had tornados Rossini – decadence on a plate, the steak perfectly cooked and the foie gras on top just sublime. Our mouths were in heaven. The wine list was very, very impressive (though mostly unaffordable with Margaux and St Emillions at around $600+). Still we managed to choose a decent 2005 Cotes du Rhone. The food cost didn’t break the bank (high end Sydney prices) but the alcohol almost did: 2 martinis, bottle of red and 2 frangellicos for desert. But it was worth every cent and I don’t think I’ve had a better French dining experience. The food certainly leaves my old Melb favorite (France Soir) for dead. Who’d have thunk! 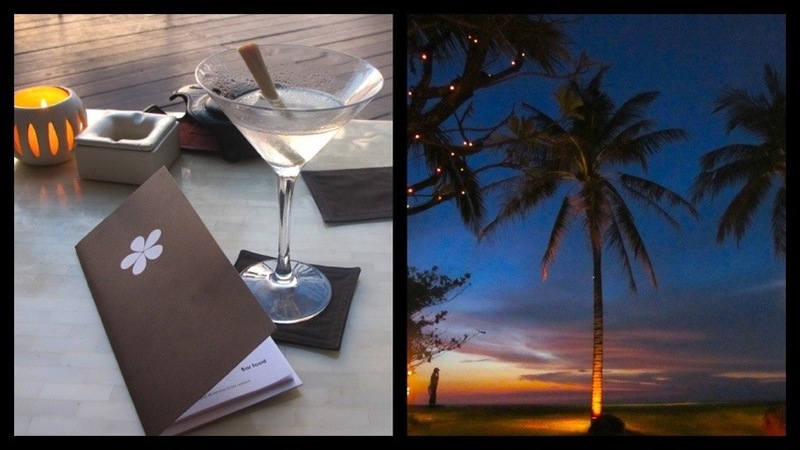 Redeemed my perceptions of Seminyak somewhat. It wasn’t until one night sitting at the bar at the Bentley Bar watching Abby make cocktails and martinis and quizzing her all the while that I thought I’d try a martini. She suggested a vesper which I thought somehow apt (ok the spelling’s totally different but it still held a soupçon of exoticism and it was my second cocktail). Well I was sold. Next time at the BB I asked Abby to create something for me with Millers gin and again she made me a gorgeous martini. And now I’m hooked. No more negronis for me, it’s martinis all the way. Last night at Sipi I started with a wonderful lemongrass martini – dry with a hint of fresh lemongrass and of course beautifully presented with a small stalk of lemongrass in the glass. Tonight we’re sitting at La Lucciola watching the sunset – a truly breathtaking experience and drinking the most wonderful ginger and lemongrass martinis. Dry. Hint of crushed fresh ginger and lemongrass. Delectable. Sophisticated. One of those drinks you just sip.I feel very grown up indeed. With apologies: having difficulties with wifi. I can’t believe that people like this place. It feels like a cross between Noosaville and Lakes Entrance. Shop after shop after shop selling ‘holiday’ clothes I can’t imagine anyone buying. But clearly they do. There’s no accounting for taste (or the lack thereof). And then of course there’s all the usual tourist rubbish: cheap thongs, sandals, bangles & beads. And the fakes. I was surprised to see so many Polo shops until I realized they weren’t Ralph Lauren- they were the gaudier Chinese versions. Astonished too to see a Paul Smith store. Went in to see if perhaps I could afford something – of course there wasn’t a single item that even vaguely resembled a Paul Smith garment. More fakes. But they seem to get away with the branding. So no shopping. But we did find wine. The people watching can be interesting: in a cafe a group of 10 loud large Australians (with their overly fed offspring) were negotiating tables and chairs in a tiny place that was set up for mostly 2 pax. Then oF course they all had to decide on what to eat and drink. Loudly. We moved to the other side of the cafe where I was transfixed by an elderly man in an emblazoned black t-shirt, colorful tattoos all the way up his arms and many silver bangles & necklaces. Poor guy. I almost laughed out loud when he had to put on his reading glasses and reveal his mid(late) life crisis. Then there was the Frenchman clearly oggling the young Indonesian waiter. He had badly died hair, sweat pants rolled up and cheap plastic sandals with socks. What a sight. But our villa is nice (except that the pool is at bath temperature) and the other people staying here very friendly (4 villas in a small complex). And today we spent the day at the beach watching inexpert surfers catching waves (this is obviously an ideal place for people starting out) and spent some happy hours jumping waves, reading, drinking and eating fresh tropical food. Sitting here on our balcony drinking some rather rough Chilean wine (but better than the poor Australian offerings) and eating some delectable chocolates from Chocolatier in Melb, courtesy of our wonderful new friend Ruth Smith, patron of the afore mentioned Orphan Centre. It’s our last night here and I’m sad to be leaving. 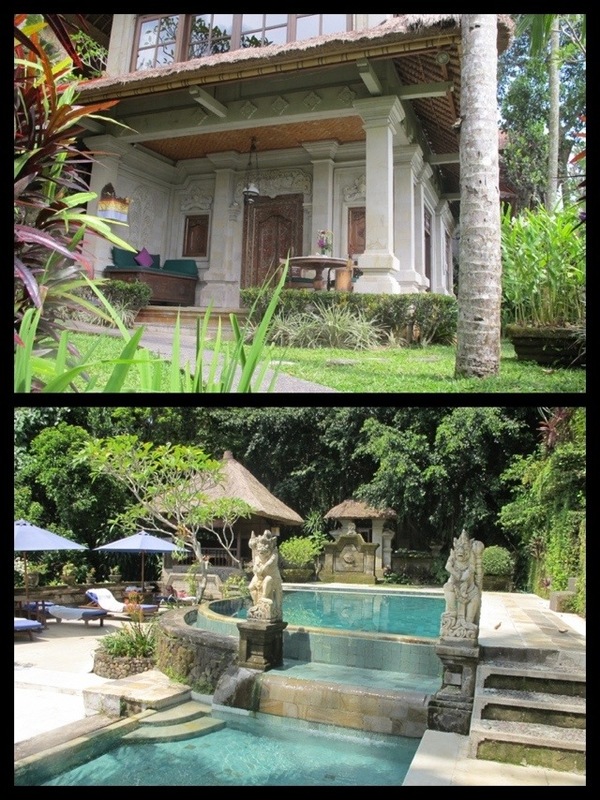 We’ve had the most relaxing time here at Alam Indah, and contrary to our friends’ advice I could happily spend two weeks here. It’s a haven of tranquility and I don’t think I’ve ever been so relaxed or content. Tomorrow to Seminyak. Feels like a retrograde step back towards the bustle of ‘civilsation’. A step closer to returning to work. 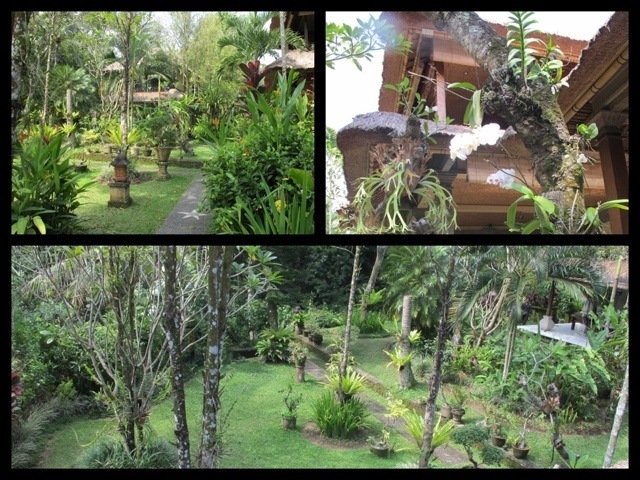 But in the meanwhile there are frogs and birds and crickets and the muted sounds of Balinese music in the distance. All else is just peace and quiet. Had dinner last night watching a performance of the Ramayana performed by orphans. The accompanying brochure was woeful – badly written English translation & poor quality reproduction (a b/w photocopy). I couldn’t help myself and offered to create something nicer for them. Turns out the orphans attend a day centre assisting them to complete their education, supported by a lovely Melbourne couple – a surgeon and his wife, a midwife. Today we visited the orphan centre – a school doing amazing things with very little money grateful for whatever can be done. Seems to me we’re all so ready to help kids in far off countries (think World Challenge in Cambodia & Thailand) but nothing here on our doorstep. M & I have now taken up their cause. I’m interested in doing what little I can -creating some brochures and trying to get some local books published. Will be grateful for any support in this enterprise, eg a set of Velcro stick on dots (which they can’t get here) to help them mount an exhibition of the kids’ artwork; a scholarship prize of $15 will buy 4 books. $10 buys a school uniform- of which under Indonesian law they need three. About $100 per annum covers their primary school fees. The kids learn traditional dance at the centre, and their earnings from performances are split 50/50 between the kids themselves and the centre’s running costs. The bulk of costs are still met by donations, but they’re working on a business plan to make the centre self-sustaining. Really solid people, and worthy of support. On second thoughts ~ Paradise! My heart sank as our taxi wended its way along the main street of Ubud: shop after shop of expensive tourist clutter. And thronging with tourists. It reminded me of Byron Bay only worse. Why didn’t anyone warn me?? This is not what I was expecting. I was imagining lushness, tropics, peace – a small magical hinterland. Yes, I know I’m probably one of the few people on the planet never to have been to Bali & now I know why. Except. We’re staying at the most tranquil and heavenly place on earth. 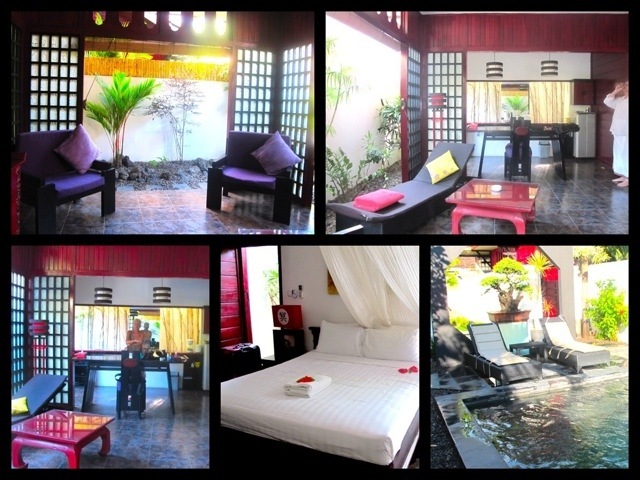 Truly it must be the most gorgeous and relaxing place we’ve ever stayed at. Right behind the Monkey Forest – in gardens lovingly tendered and beautiful sculptures/statues everywhere. Orchids grafted onto trees everywhere (can someone look in on my poor orchid which is probably dying in my office?). Our activities consist of a walk thought the Forest to the main street to have a coffee and use free wifi and then a laze by the pool followed by lazing on the huge daybed on our very spacious balcony listening to the various birds. Stroll to dinner – last night we saw a Balinese dance performance while eating some wonderful smoked duck. I can understand why people come here. And even not having a SIM for my phone & iPad has turned into something of a blessing: freedom from connectivity. Now I really do feel like I’m on holidays. Posted on April 5, 2012 Categories UncategorizedLeave a comment on On second thoughts ~ Paradise! 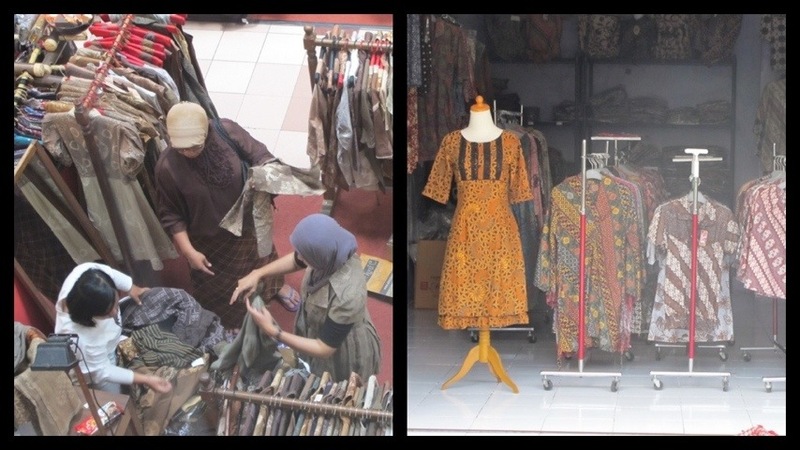 In all this tropical lushness the thing that surprises me most is how drab the clothes and batik are. Shades of pooh brown with some khaki thrown in to enliven it. How can you tell people who are so proud of their cultural designs you don’t want to buy because you find it ugly? Though I must admit I don’t add to the spectacle – it appears that in all photos I too am in a shade of drab. Time to bring out some colour. I suppose the reason for traveling to foreign places is to see the sights and try to understand the culture. That usually entails going to all the tourist attractions. 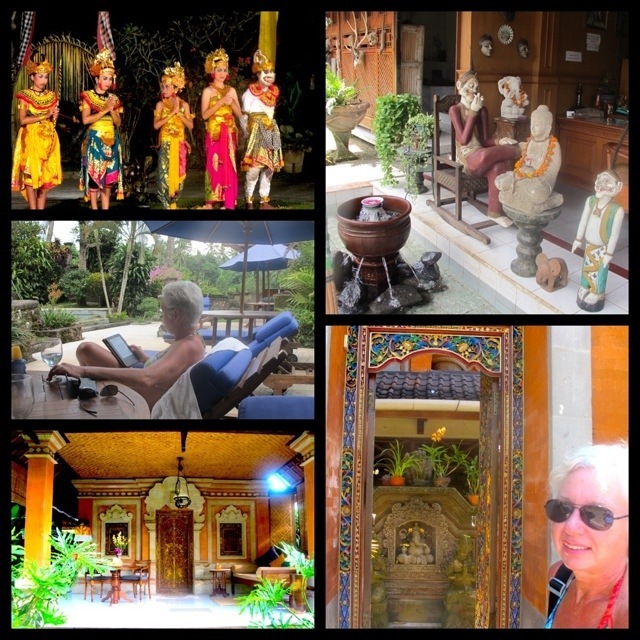 Thankfully in Yogya there are relatively few and so we have been able to spend our time here doing very little. An excursion in the morning. Followed by reading poolside with a couple of G&Ts. And we go to bed very early. That’s partly because there’s little to do here and partly because we wake so early. The muezzin call is at 4 in the morning – not 5, which somehow seemed a bit better. Sunrise is sometime after 5 so we’re up around 6 (though obviously awake much earlier). By 8 o’clock we’re ready to go. 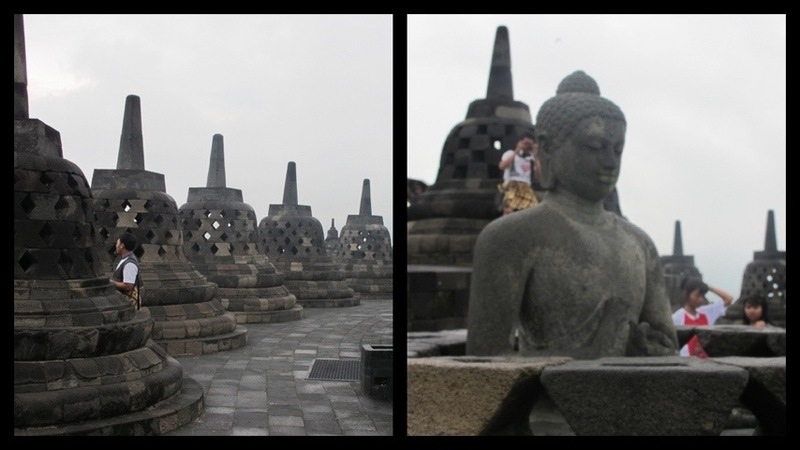 The other day we organized a car to take us to Borobudur – the ancient Buddhist stupa – about an hour’s drive from here. We were asked if we wanted to go to see the sunrise (what most people do) but on hearing that it required starting off on our journey at 3.30am we opted for the more civilized departure time of 6am. Did we require a wake-up call? With the muezzins competing over their loudspeakers before dawn? Unlikely. Had we known the roosters would start crowing at 2.30 we probably would have gone for the sunrise spectacular. As it turned out it was a bleak day with intermittent rain. A blessing really because it kept the tourists at bay and those who did venture out seemed intent on climbing to the top, having their picture taken with a foreign tourist (M and I started to feel like tourist attractions: mister can we take your photo?) and then scramble back down. 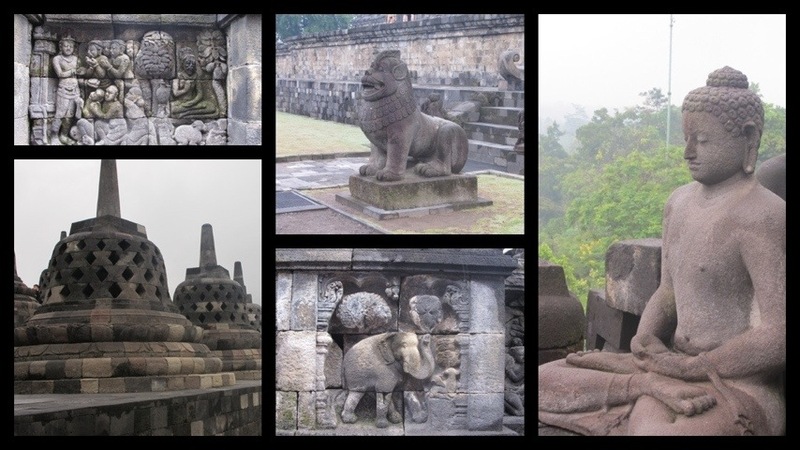 Borobudur is interesting: every surface of the lower 6 levels is carved in relief. The upper levels are circular and have giant stupas which are like domes (or like hand held bells) with seated Buddhas inside. The idea is that you walk around each level clockwise and contemplate the carved narratives. A spiritual practice. But it’s not a patch on Angkor Wat where the power emanating from the ancient places of worship was palpable. And just more beautiful. But all praise to Raffles who was responsible for Borobudur’s restoration. Alas no wonderful hotel in which to sip cocktails here. Actually, there are no cocktails here. Or wine. Bintang anyone?